This season Guerlain adds two new items to its Abeille Royale skincare line. 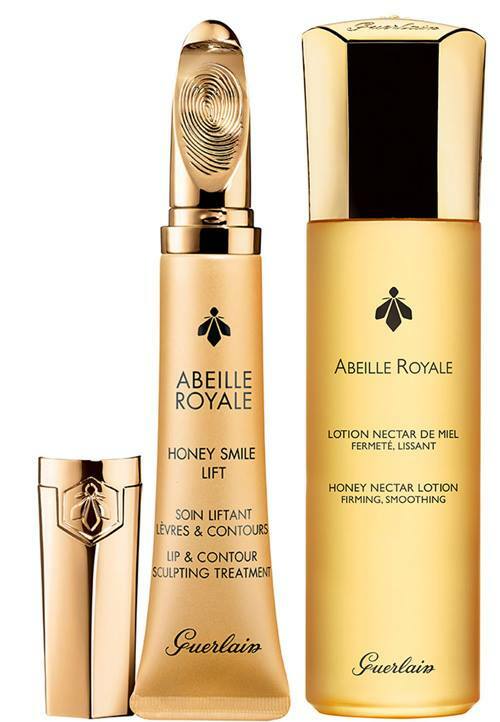 We have the new Guerlain Abeille Royale Honey Smile Lift Lip Contour & Sculpting Treatment and Guerlain Abeille Royale Honey Nectar Lotion. They seem amazing and I would really love to give them a try, considering that back in November 2015 my skincare routine consisted of Guerlain products from the Orchidee Imperiale line. Guerlain’s first multi-purpose lip treatment targeting all signs of aging. Upon application, lips appear plumper, contours are reshaped and lines are smoothed, creating a defined lip shape. This concentrated BALM FORMULA, born of the exceptional repairing power of Ouessant honey and Royal Jelly, both exclusive to Guerlain, has a gourmand fragrance with delicate honey flower facets done by Thierry Wasser. Apply Honey Smile Lift morning and evening, after the eye care and before the oil or the serum. Exceptional active ingredients, exclusive to Guerlain: Guerlain Royal Jelly, made exclusively in France, is combined with the purest black bee honey from the island of Ouessant to help correct visible and future signs of aging: loss of firmness and wrinkles.